Conventional installation. Rolling shutter made from aluminum, with bearing (tube) fitted in the header. 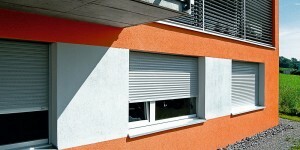 Curtain with slats 37 x 8 mm, slid in without mechanical connection, with air and light slots (except drive with spring shaft), filled with environmentally-friendly and CFC-free polyurethane, subtly embossed, baked enamel finish in RollColors. Bottom rail (end rail) made from extruded aluminum, transparently anodized. Tube made from sendzimir galvanized steel with bearings made from galvanized steel. Guide rails made from extruded aluminum, transparently anodized, with weatherproof noise insulation inserts. Fix installation. 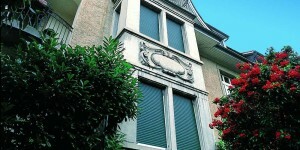 Rolling shutter made from aluminum, self-supporting system with bearing (tube) on guide rails. 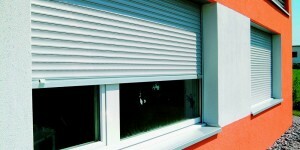 Curtain with slats 37 x 8 mm, slid in without mechanical connection, with air and light slots (except drive with spring shaft), filled with environmentally-friendly and CFC-free polyurethane, subtly embossed, baked enamel finish in RollColors. Bottom rail (end rail) made from extruded aluminum, transparently anodized. Tube made from sendzimir galvanized steel with bearings made from galvanized steel. Guide rails, made from extruded aluminum, transparently anodized, with weatherproof noise insulation inserts.